Sansa is an extremely frightened little girl. She had to be carried to the car when she was picked up from the track. 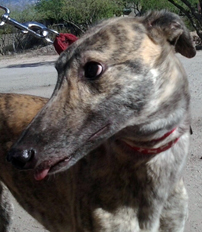 She is in a foster home now, but needs to be in a forever home quickly with other greyhounds. UPDATE: Sansa is in great shape and is making slow but good and steady progress in her transition to a permanent home. She is settling in to her foster home and happy being part of their wonderful pack. She's very contented being with the dogs at the house but is still not good with people. She has a favorite friend who she uses as a buffer. This means that Sansa is not yet ready for any public appearances or meet and greets. She is eating well but does not seem to be gaining weight yet. Please consider adding shy Miss Sansa to YOUR family.